WASHINGTON, D.C. -- Americans who say terrorism is the nation's top problem fell to 9% this month, after jumping to 16% in December in the wake of terror attacks in San Bernardino, California, and Paris. 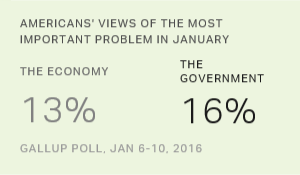 With concern about terrorism down, the government and the economy have resumed their top-ranking positions on Gallup's list of most important problems, with 16% in early January mentioning some aspect of government and 13% naming the economy. These issues ranked either first or second on the list for most of 2015. 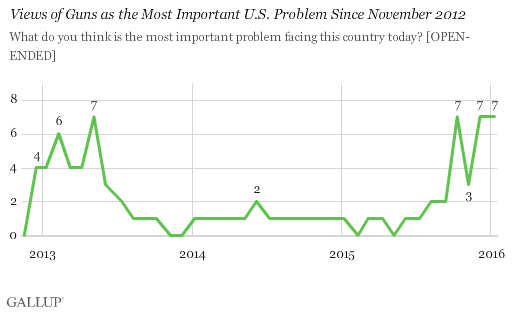 The economy, in general, has ranked among the most important U.S. problems mentioned since early 2008, peaking at 58% in late 2008. Also topping the list are mentions of the government -- including Congress, the president, corruption and partisan rancor. Combined mentions of government peaked at 33% in October 2013 amid the partial government shutdown and, since then, have garnered at least 13% in the monthly poll. Other frequently named issues in January were immigration (8%) and guns (7%). 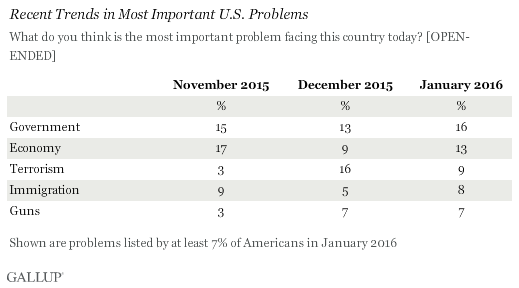 This is the second month in a row that 7% have named guns as the most important problem. And it is the first time since the end of 2012 that mentions have been above 5% for two consecutive months. Historically, concerns about guns typically increase immediately following highly publicized U.S. shooting incidents but then quickly subside the following month. This occurred in December after the San Bernardino incident, but concern remained elevated in January, perhaps in response to calls for major gun control reforms by President Barack Obama. As mentions of terrorism as the most important problem facing the U.S. declined in early January, mentions of the government and the economy both increased slightly, and those issues have returned to the top of the list. Concern about guns remained relatively high for the second straight month, perhaps indicating that the president's calls for changes to gun control laws are resonating with some Americans. But with no issue topping 16%, the year starts without an overriding problem on the minds of Americans, perhaps paving the way for Obama to focus his final year in office on some of the other issues he outlined in his State of the Union address. The issues range from funding community college and addressing climate change to supporting the development of clean energy and curing cancer. Results for this Gallup poll are based on telephone interviews conducted Jan. 6-10, 2016, on the Gallup U.S. Daily survey, with a random sample of 1,012 adults, aged 18 and older, living in all 50 U.S. states and the District of Columbia. For results based on the total sample of national adults, the margin of sampling error is ±4 percentage points at the 95% confidence level. All reported margins of sampling error include computed design effects for weighting. The percentage of Americans naming race relations or racism as the most important problem facing the nation rose in July. While mentions of race relations have ticked up in recent months, these increases have been short-lived.